Beervana Buzz: The Elusive Question: Can Beervana Keep Growing? 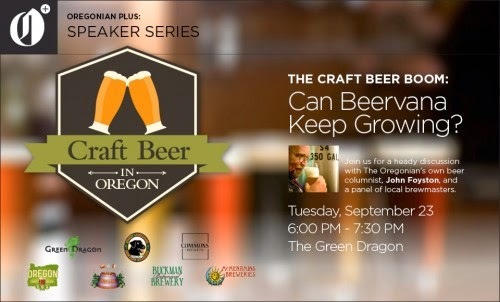 Tuesday evening's Oregonian Speaker Series program at the Green Dragon was set to address this question: Can Beervana Keep Growing? Pretty straight forward. All of the pre-event materials included a reference to the significance of that question. And let's face it, this is a question that's on the minds of many. Despite the fact that craft beer is booming in Portland...or maybe because it is...a lot of inquiring minds wonder if we might be reaching a saturation point. Are we coming to a moment where there's a shakeout such as we had in the mid-1990s? Karl Ockert, founding brewer at Bridgeport and technical director of the Master Brewers Assn. The conversation veered back and forth under Foyston's guidance. 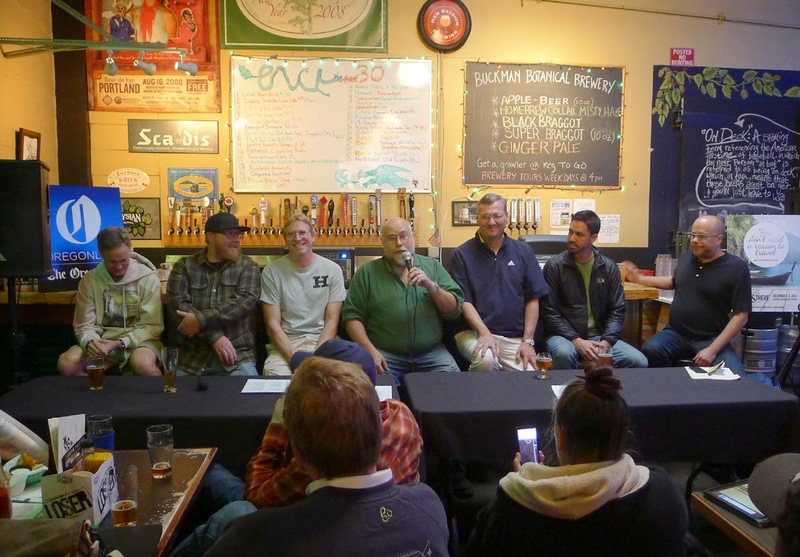 Panelists discussed what it was like in the early days of craft beer in Portland. Like Rome, the beer culture we have wasn't built in a day. There was also talk about the proliferation of styles and mention of today's crazy financial numbers. Lots of smiling faces. I should mention that the audience was made up largely of industry-connected folks. The gal seated next to me manages one of best craft beer watering holes in the city. Across from me was a gent who is preparing to open a taproom in Hillsboro. He introduced me to a banker who works with beer-related businesses. Nearby, I identified brewers and other industry folks. Given the audience, it was probably best that the quintessential question involving future growth was never asked...or answered. One or two panelists briefly offered that they saw no end to growth in sight. Butenschoen pulled out (what appeared to be) handmade charts showing steady growth over the years. Relief circulated around the room. However, I was hoping for a little more. I know I'm not alone in thinking Portland can't accommodate an infinite number of breweries. We consume a lot of the beer we make and, because our beer is in demand in other parts of the country and world, some of what we make can be exported. But we will reach a saturation point. We just don't know when. The question of how many breweries is too many is complicated. A lot of factors play into the economics of beer in Portland and elsewhere. There's certainly no way the issue was going to be fully evaluated and addressed by this panel during the hour or so they occupied the stage. In fact, if organizers intended to seriously consider the question, this wasn't the panel to do it. Why? Mainly because folks who have a vested interest in an industry generally aren't the best objective sources. It's a little like asking the NFL how it's doing on domestic violence and expecting a candid answer. No offense to anyone on the panel, but it really should have included a mix of people who watch the industry, but aren't financially linked to it. That approach has a potential downside, for sure. You may wind up hearing things that run counter to industry thinking. That sort of thing can create controversy and make people feel insecure about the future. Which can be bad for business. And pocketbooks. Tuesday's gathering was an entertaining event. The admission ticket included a pint of beer and the Green Dragon has a great tap list. It was great to see familiar faces. But the question of craft beer's future prospects was never seriously asked or discussed. Not the best...given the billing. There's always next time, I suppose.